Just for fun, I'm sharing an illustration I made for Sofia. She isn't a runner, and with her knees still recovering from last year's surgeries she was so nervous to have to run 2K in her gym class. 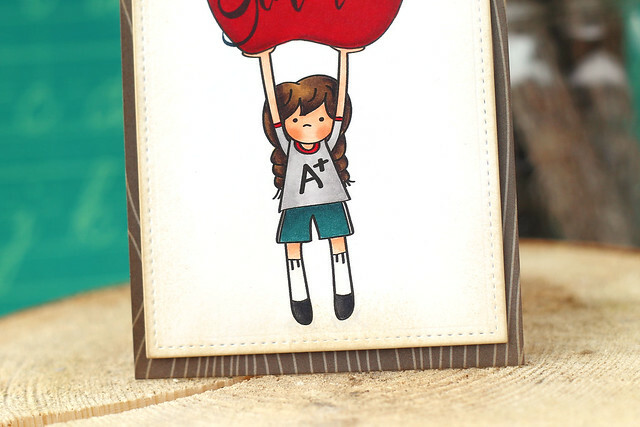 I tucked this little card into her lunch box and hoped it would put a smile on her face. I hand-drew the girl and her huge apple, then scanned and turned it into an illustrated digital image for myself. I thought she looked pretty cute in her little gym shorts and high socks. A little retro cool. But maybe not with black shoes. haha. Not sure why I colored those that color now that I look back. 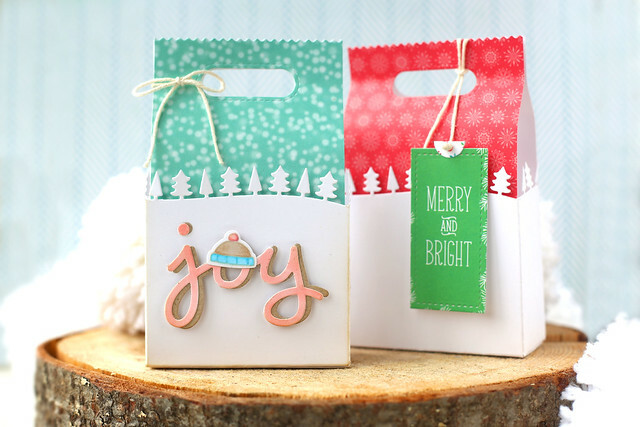 I used my favorite Avery Elle sentiment, and stamped it twice for a heavier and crisper impression. I wanted to make sure the sentiment would stand out. 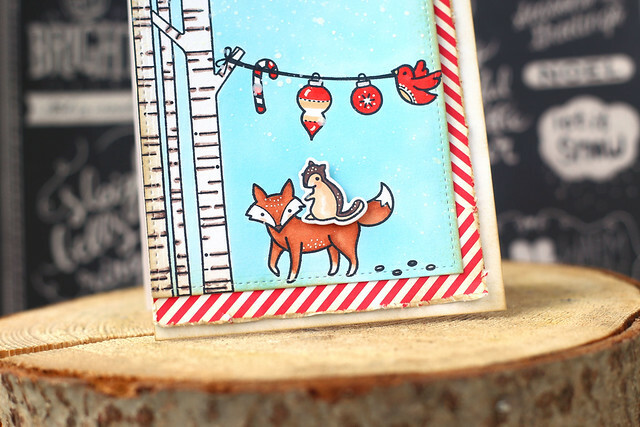 I used a stamp-a-ma-jig to make sure that I landed in the exact same place on the second stamping. My hands aren't steady enough to wing it. I also did some fancy die-cutting around the apple stem and leaf: I washi-taped my stitched rectangle die where I wanted it and sent it through the big shot 3 times: once to cut the lower half of the rectangle, and then on either side, making sure not to cut where I had the apple bleeding outside of its borders. Finally, some scissor work to cut the top of the apple and make it look seamless. I loaded the whole thing onto a walnut notecard (I need more and more of these, I can't stop using them!) and popped it into Sofia's bag. Here's to not giving up. 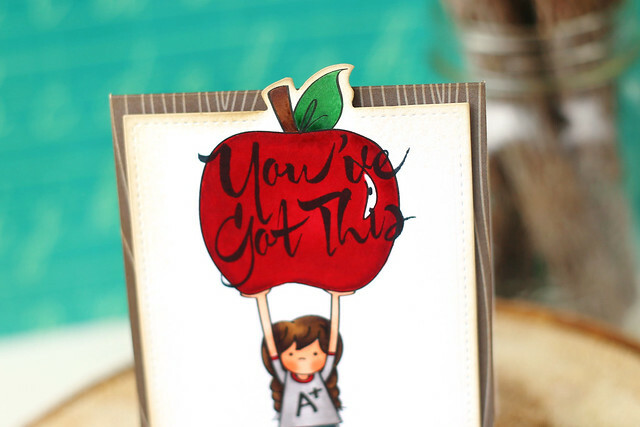 You've got this, not matter what your "this" may be. With lawn fawn's inspiration week over, I'm at the end of my marathon blogging of 9 days in a row. And even though this the last project I'm sharing with you, it was the very first one I created. 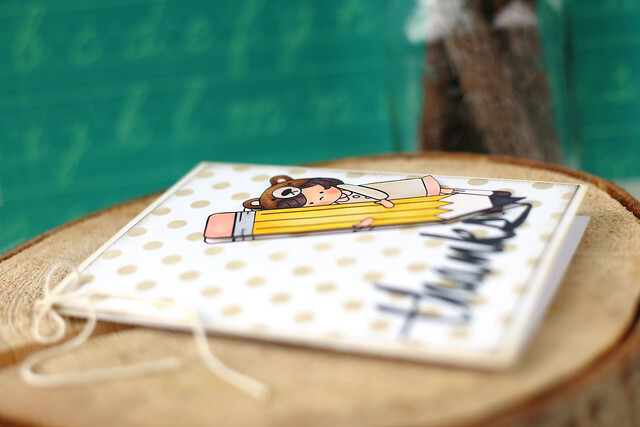 When I received the Mama Elephant dies, I was trying to make little cards and things for the kids to brighten up their first days at school. 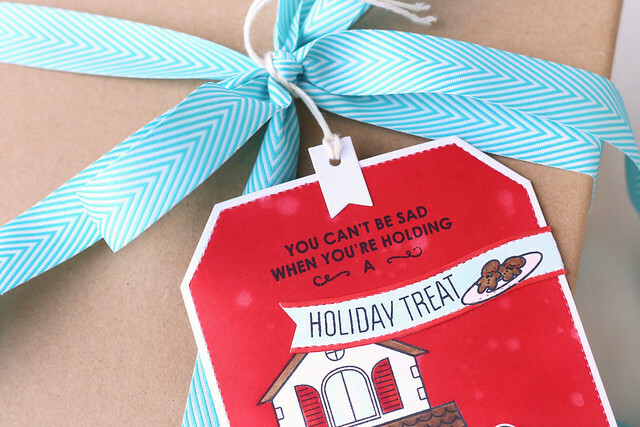 My kids are huge fans of the carnival cupcakes set that was released last month, so I knew they would love these tags. I didn't anticipate my son coming home telling me how much he loved the treat, but that he got teased by his friends. I guess we're at that age now. He told me to keep making him stuff, but could I please just give him the tags separately at home? ha. 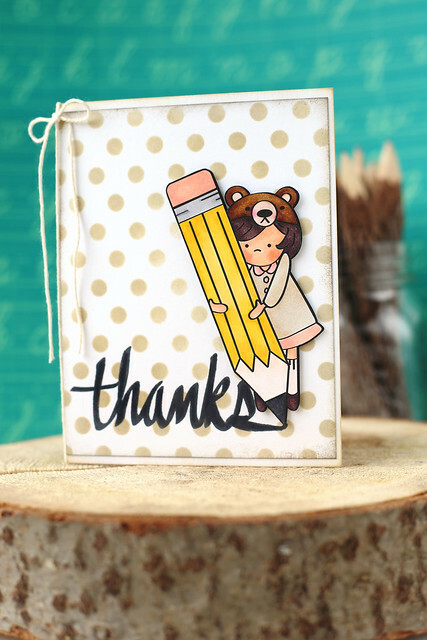 I combined the adorable bear image with a custom sentiment using sketchy letters. And inside the packages? 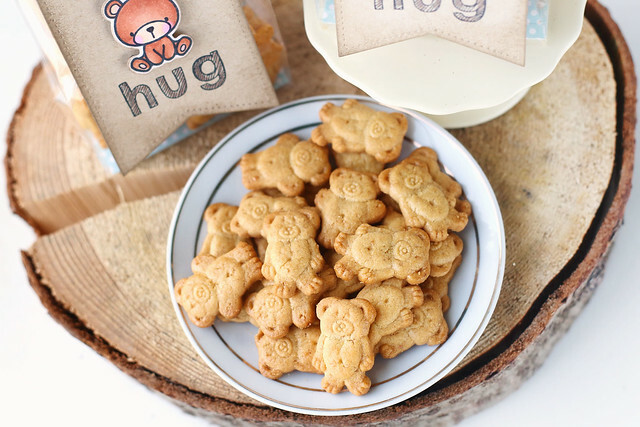 Had to be bear cookies, of course! 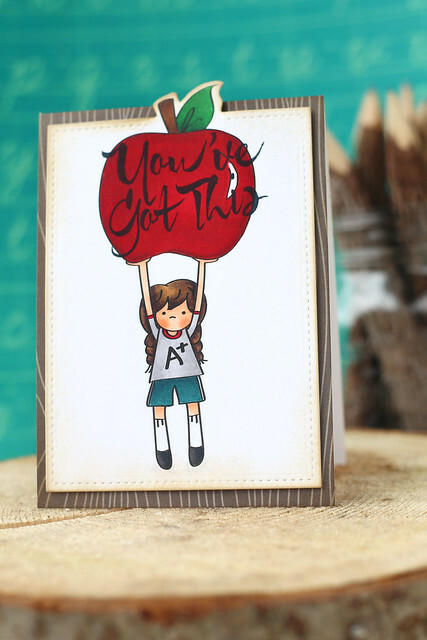 We're hitting the tail end of Lawn Fawn's September inspiration week. What'd you think? 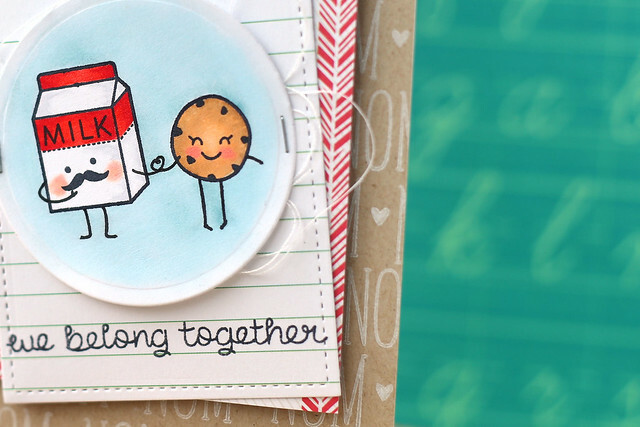 Today, we're showing off the adorable Milk and Cookies and its coordinating dies. and decided it had to be remade with my lawn fawn set. I kind of love their poses! 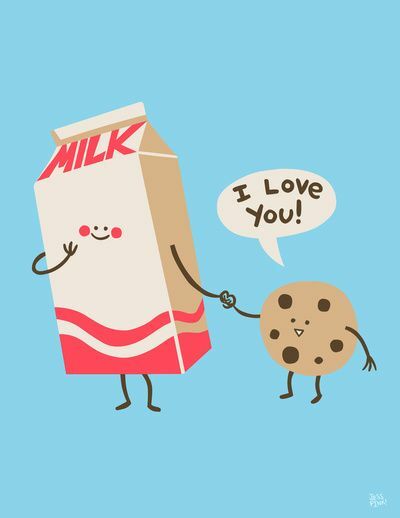 I gave the milk a mustache (ha) and the lady-cookie has demurely turned in feet. Where their hands meet it twirls into a heart. awwww. 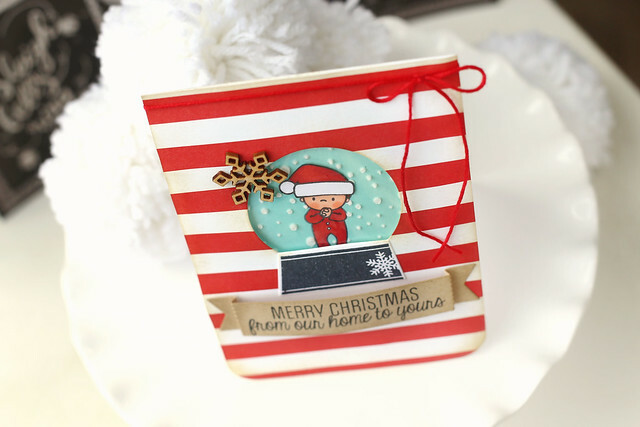 I kept this card pretty scrappy by cutting 2 stitched rectangles (from the snow day paper collection) and angling them over a stamped background. 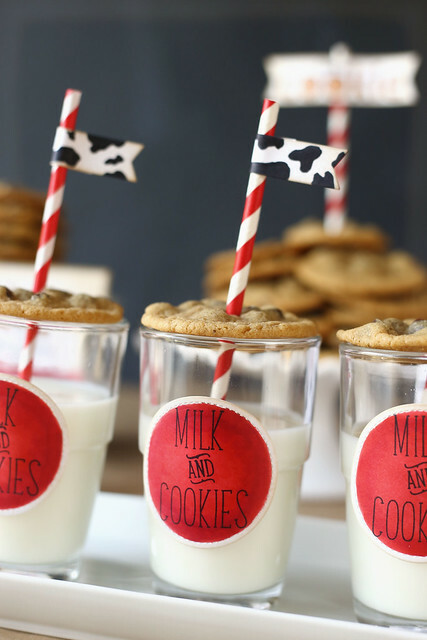 If you want to see what else I've done with this set, check out my milk & cookies party. 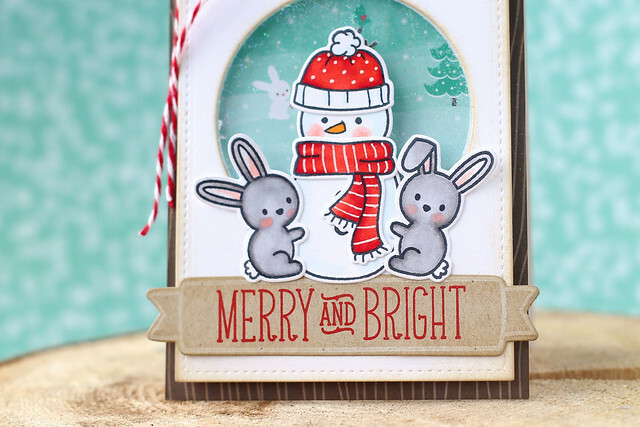 And don't forget to stop by the lawn fawn blog and see what the rest of the design team has cooked up. 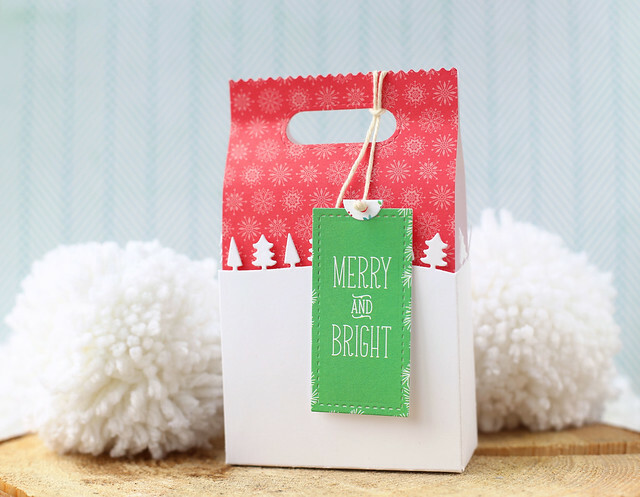 I made treat bags to show off lawn fawn's new snow day collection. It's the regular goodie bag, but I combined it with the forest border to give it an extra special look. So let's get to the tutorial! 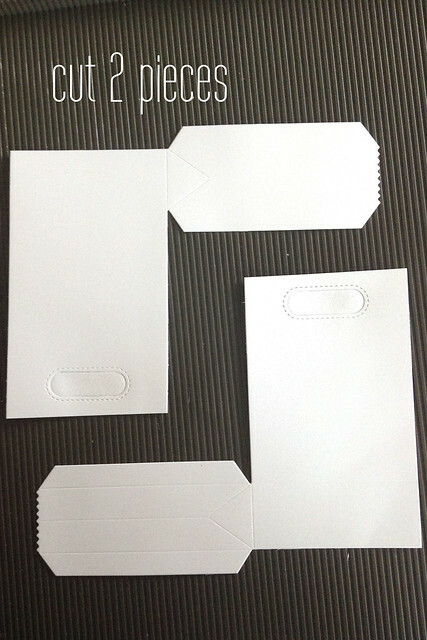 In case you can't read the type on the pictures, I'll repeat it: cut 2 goodie bag pieces. 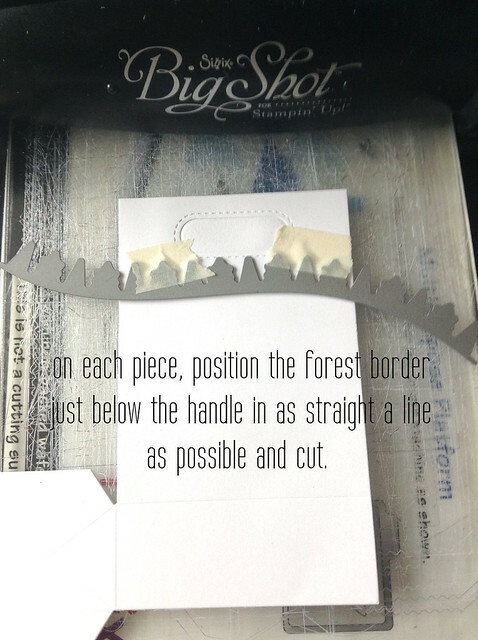 On each piece, try to find the straightest portion of the forest border die, and cut just below the handle. We want that thing off! 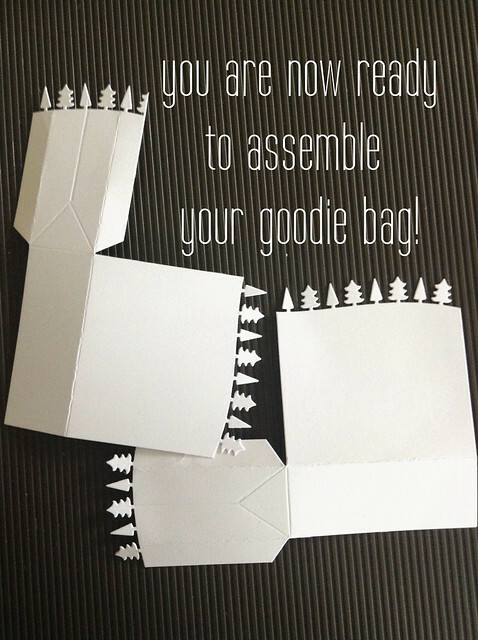 The trickiest part: don't assemble the bag yet! Hold the front of the bag, with the forest border and pinch it to the side. 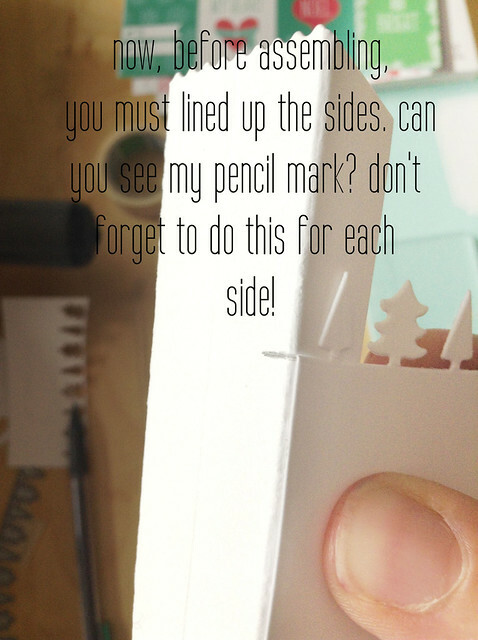 Make a pencil mark where you will want the edges to line up. Do this for each side! 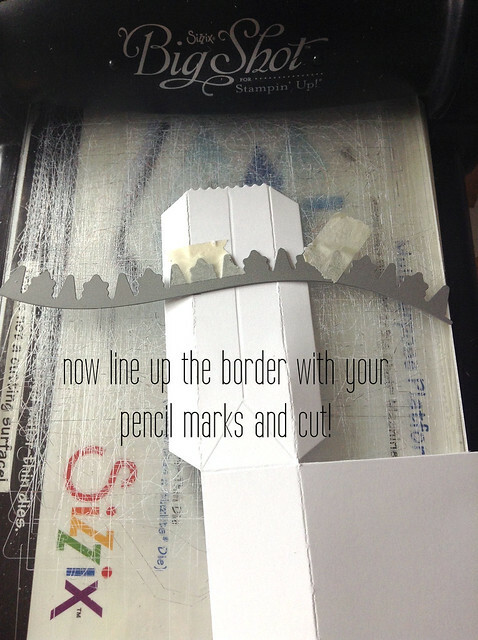 Once each side has a pencil marking, you can line it all up and send it through your machine. All ready to be assembled! 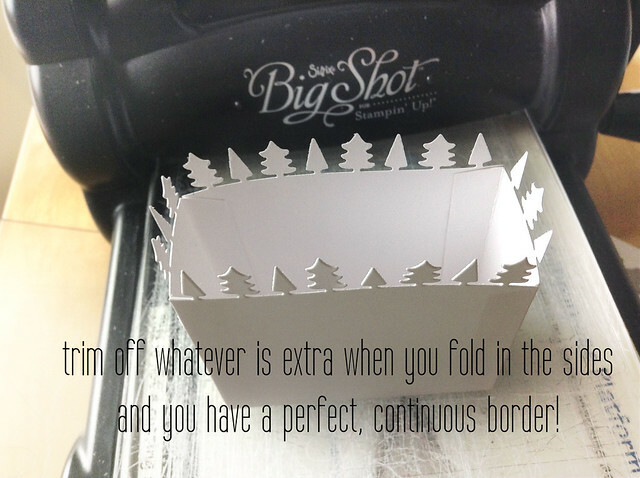 Trim off whatever is extra when you fold in the sides and there you have a very pretty looking holiday box! 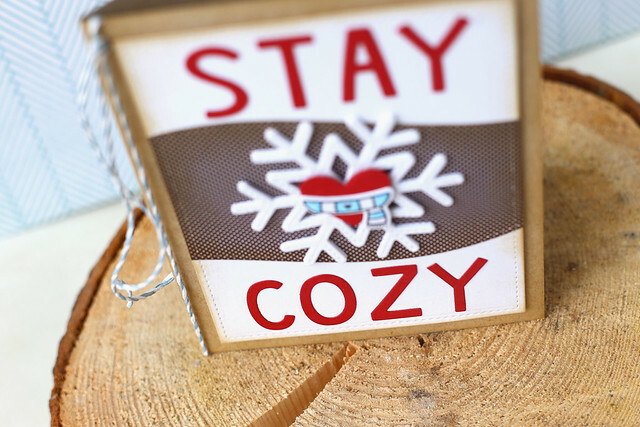 Check out the lawn fawn blog for more snow day collection inspiration - click! It's getting colder here. Sweater weather, air-conditioning turned off, near freezing temperatures in the morning. Tall boots, too. 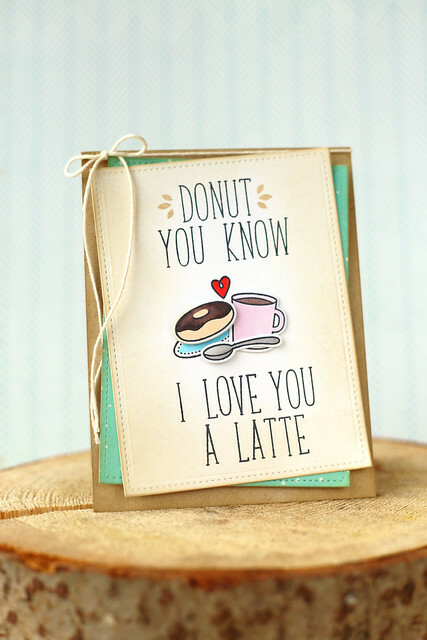 I even had a salted mocha latte at starbucks the other day. Today, I'm showing off stitched snowflakes. 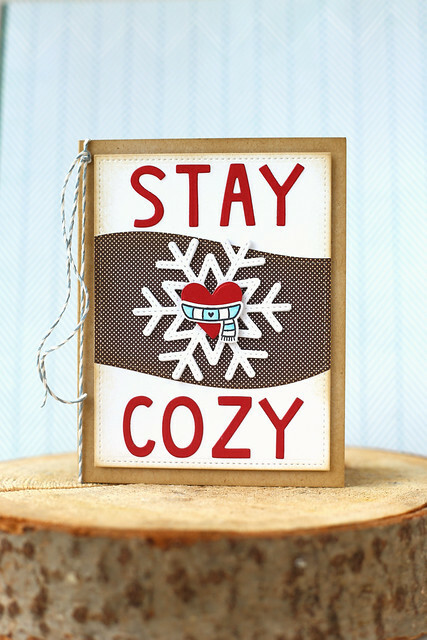 I used Finley's abcs and the Snow Day heart layered over a stitched snowflake. 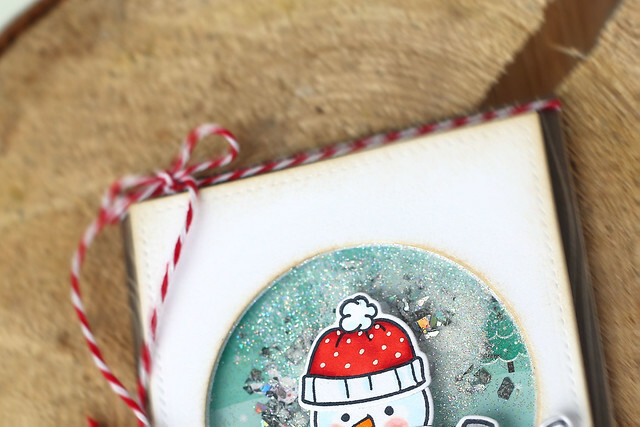 I gave the snowflake some chunkiness by layering 4 of them together. No need for foam tape now! The wavy middle panel was created by die-cutting the same rectangle shape as my base layer, and then using the stitched hillside borders on either side. I love the finished look I got by keeping a stitched border all around. 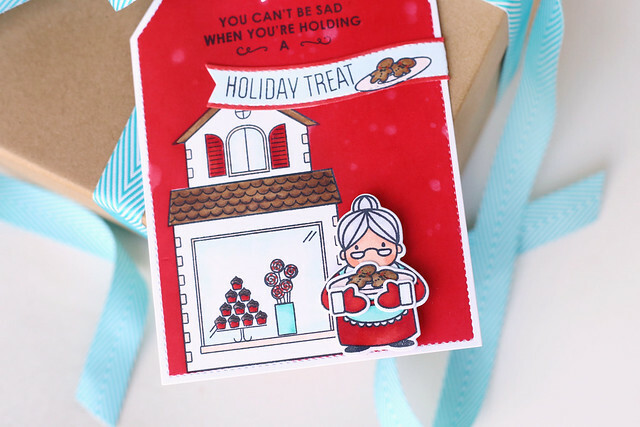 I'm back again here and on the Mama Elephant blog today, for a closer look at the new Cozy Christmas dies and what you can do using them. but he was too short. Here's what I did: i cut him in half. Complicated, right? ha. 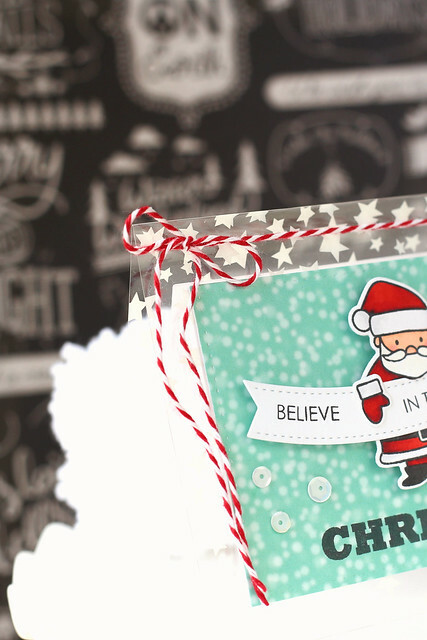 Having sliced Santa above his belt, I was able to take my scissors and cut around his beard a bit, so that when I put the card together, his beard could overhand onto the sentiment banner. 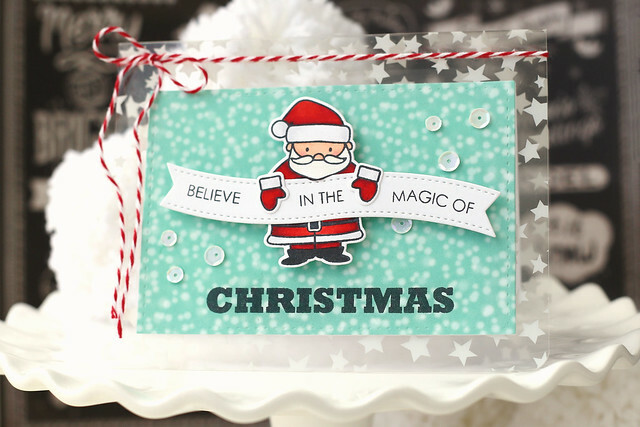 Once I had everything stamped out (including the sentiment from Believe in Magic,) I adhered the focal rectangle to a starry clear card base. I think this is my first-ever acetate card base. Pretty nifty. 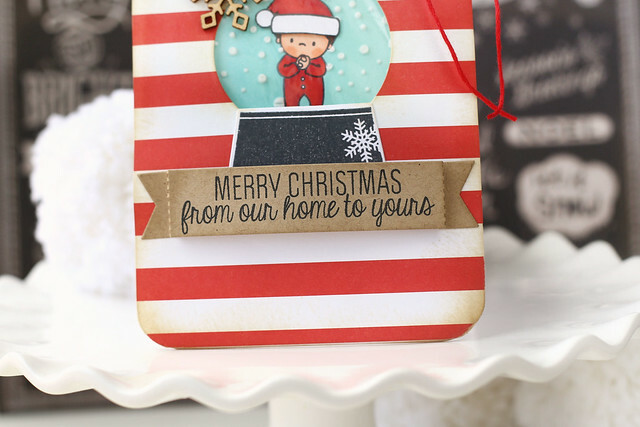 A length of candy-cane twine and some pretty sequins finished it off. That was that! 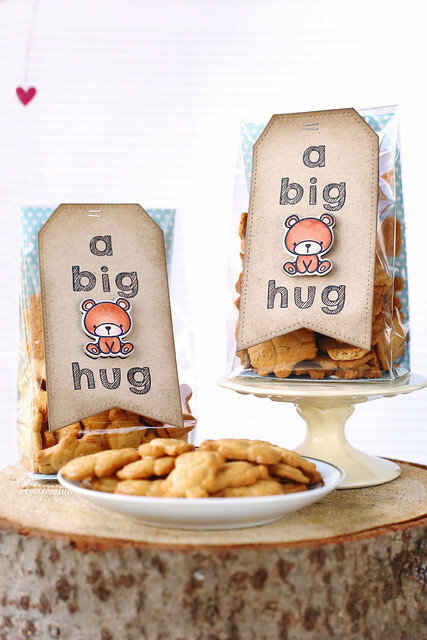 I hope you like what I made for you today, Visit the Mama Elephant store to see what else is new this month - click! I will be back tomorrow, and the day after that, and the day after that, and for the next 6 days in a row - because today marks the beginning of Lawn Fawn's September inspiration week! Check out their big giveaway post here. 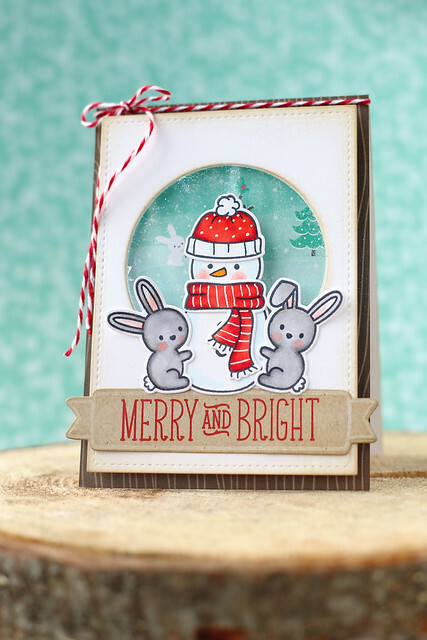 And, did you see the exclusive set lawn fawn designed for Simon Says Stamp's big Stamptember event? You can see it here. 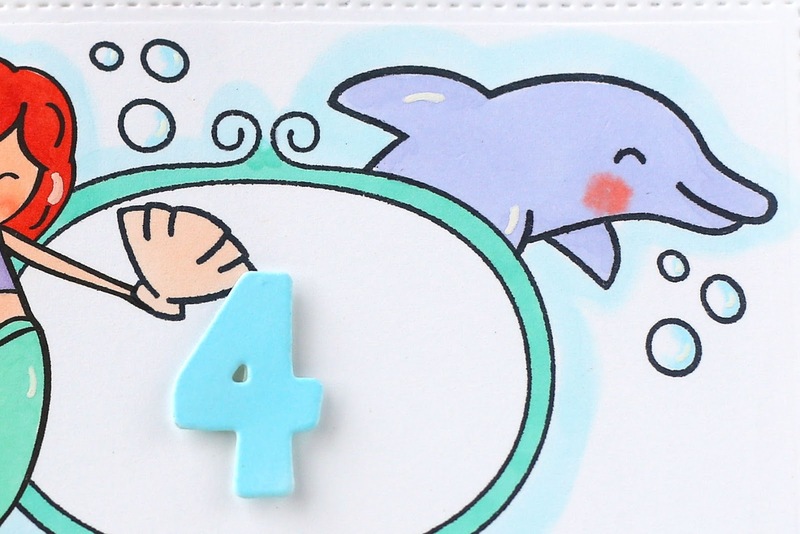 My niece is turning 4 at the end of October and wants a mermaid party. 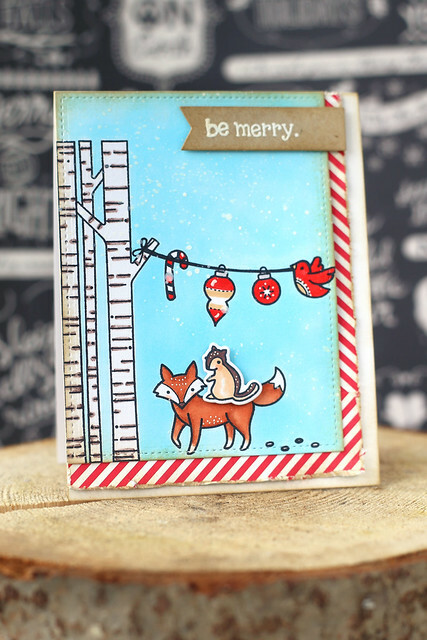 You recognize some of the stamps: lawn fawn's critters in the sea and the frame from sweater weather. But what's that on the left? Oh yeah. I drew myself a mermaid. And she fits right into the lawn fawn scene with an ease that blew my socks off. I can't wait to keep making more decorations for this party. The more I play around in Illustrator, the more excited I get to create new images. I cannot wait for you to see what I have in store in October! Stay tuned! Hi! 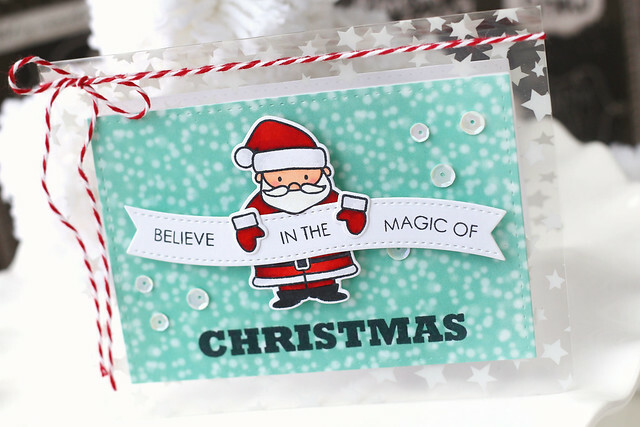 I'm here with a pair of projects to show off the new Mama Elephant dies for Believe in Magic. I have loved this set since it was released last year, and now I love it even more! The dies will be available for purchase as of September 15th. 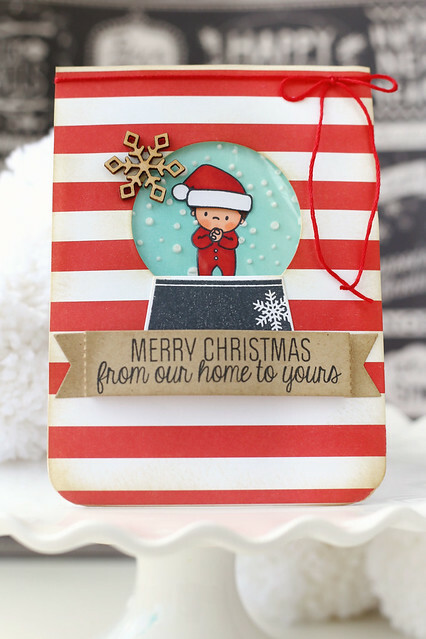 My first card features a snowglobe-santa-baby. hee. I love that he's wearing Christmas pjs, and a Santa hat (borrowed from Santa himself, from the Cozy Christmas set.) I stamped the little boy, masked him, and swirled a light blue ink all around. 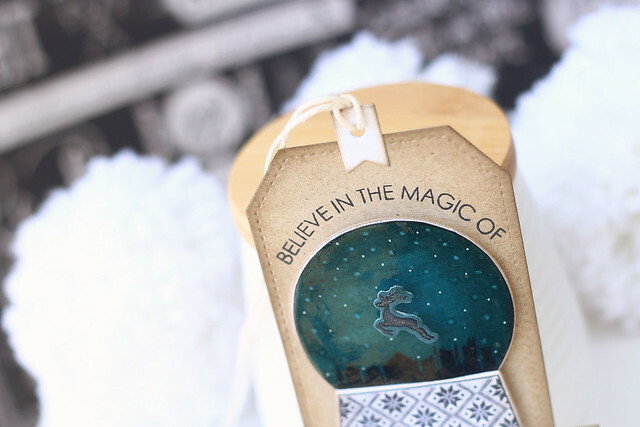 Keeping the mask on, I used white embossing paste and a snowfall stencil to create the snowglobe blizzard. 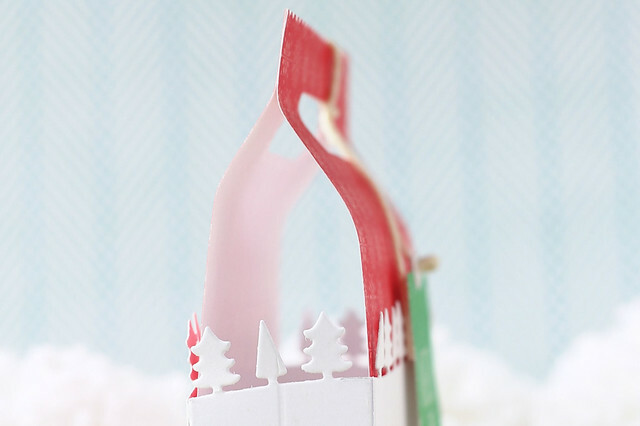 Once the inside of the snowglobe was all set, I grabbed some candy-cane striped patterned paper and used the globe's die to create an opening through which to peek my santa-baby. On the back of the patterned paper, I taped down some clear packaging (ok, really just a piece of a ziploc sandwich bag. i'm so fancy.) and propped it all up onto a white card base. 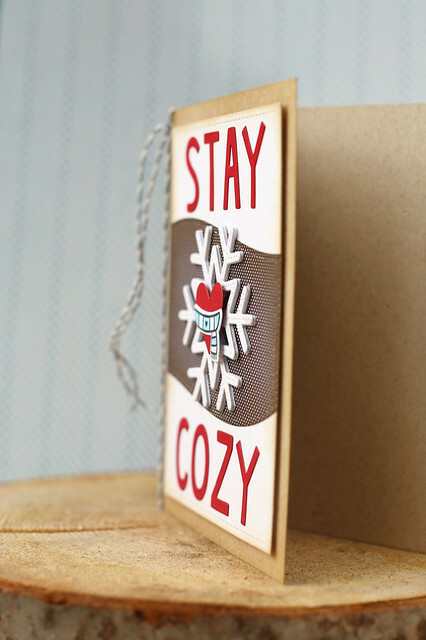 The base of the snowglobe was adhered to the front of the card, as was the cozy greeting. I love everything about this tag. The night sky, the dark reindeer (that requires no cutting, thank you new dies) and the twinkle of stars overhead. I colored the sky with dark blue and black copic markers, and then used the colorless blender to remove dots of color. 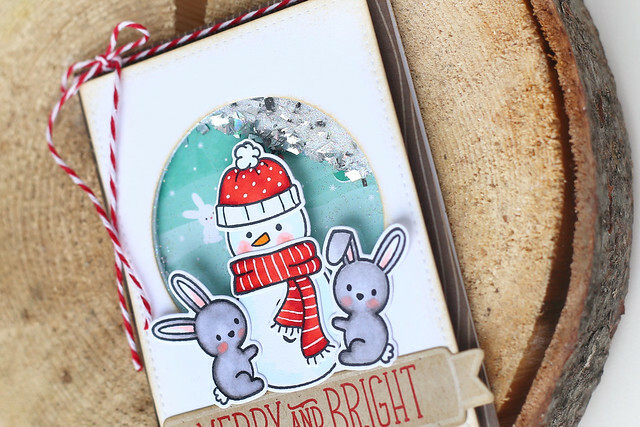 I also used a white gel pen to add brighter dots of stars. 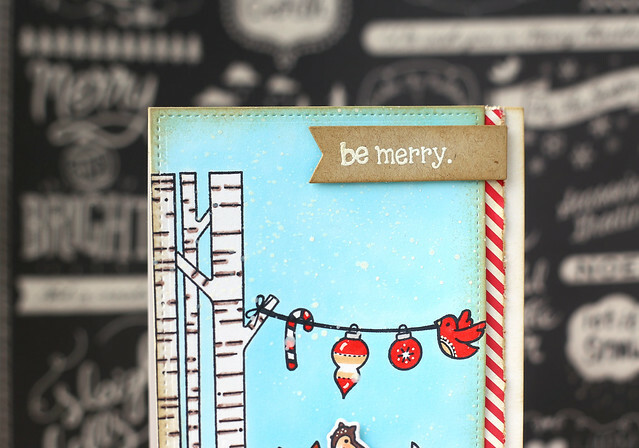 I stamped the reindeer in black and colored the die-cut outline to match the sky. I then used a wink of stella glitter pen to make him stand out a bit more. 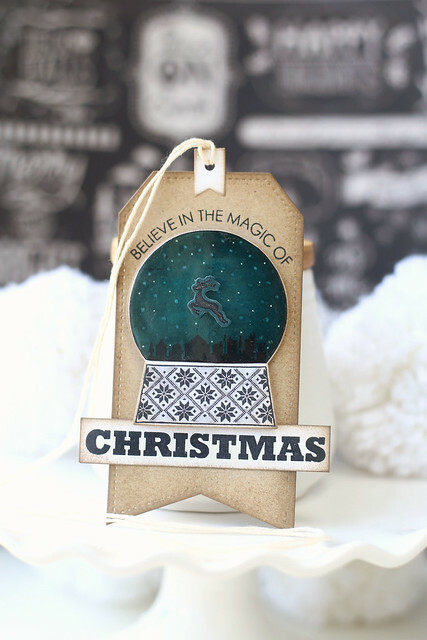 Before placing the reindeer onto the globe, I brushed on a thin layer of glossy accents. It shines in real life! I hope you like both of my projects today, and thank for stopping by! I know not all of you are into digi stamps, but as I work and practise on translating my hand-drawn doodles into illustrated artwork, I just love to be able to share a little something with you. I drew a few back to school images, but I had in mind that she could be used for just about anything. 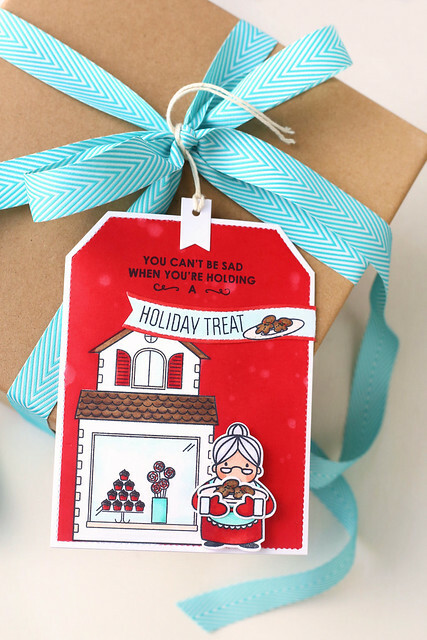 Stick her next to a dear Santa sentiment, or a happy birthday and it would be just as cute. I love her bear hat and little school-girl dress. I used a stencil on the background and printed her again so that I could fussy cut and pop her up. The sentiment is by Altenew. This is my little gift to you, thanks for visiting my blog! I hope you like her. If you decide to download and color her, leave me a link in the comments so I could come see - it always gives me a thrill! If you want to download the png file, click HERE. If you would rather download the jpg file, click HERE. 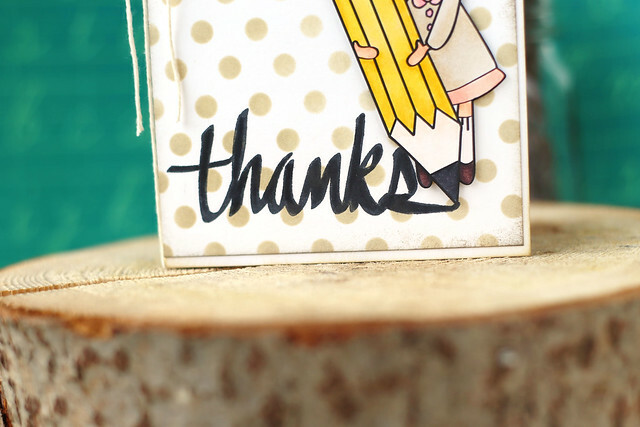 If you want to check out last month's free digi stamp, click HERE. 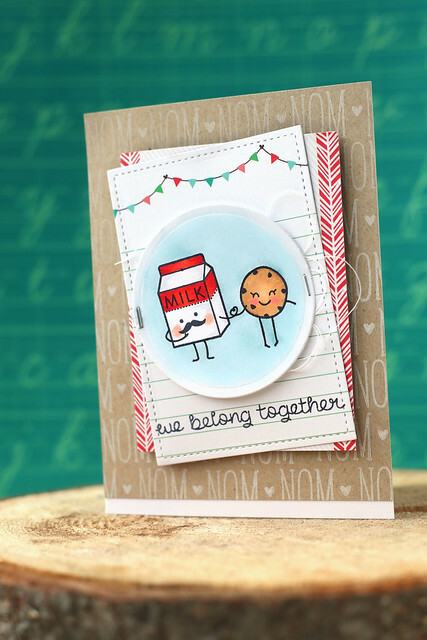 Create some decor using the new milk & cookies and violet's abcs stamp sets, bake up a batch of chocolate chip cookies, and suddenly it's a party. 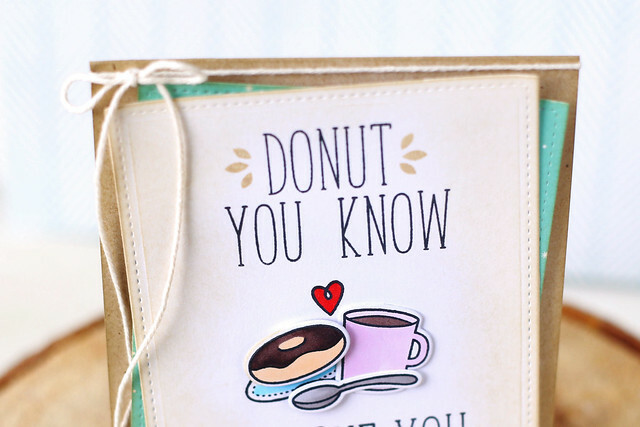 This would make the perfect little anniversary or valentine's day card too! I added some free-handed cow print throughout the decor, (and by free-handed, I mean it was me and a black copic marker, squiggling and splotching all over the place) starting with this invitation. These labels are my favorite. 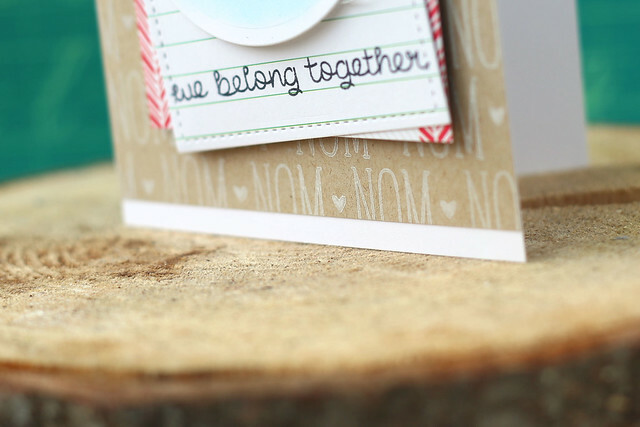 I love the white border left around the die-cut edge, and the variation of color you get by sponging the ink on. Violet's ABCS are so perfect, with that little fancy "and" in the middle, don't you think? The cookies on top don't hurt either. My kids loved this after-school snack! 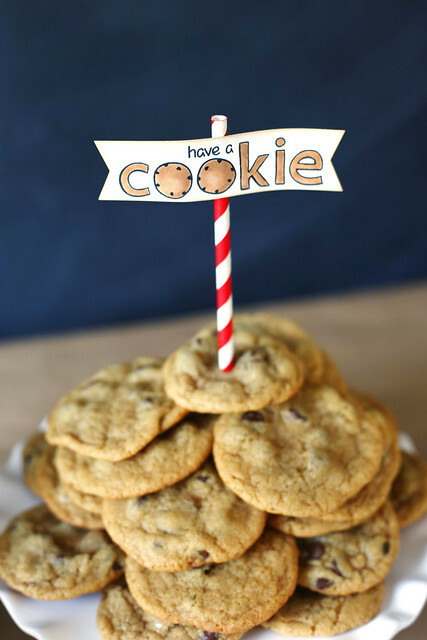 I made a simple flag to decorate the plate of cookies, swapping out the double o's for two cookies and coloring everything to look like baked goodies. 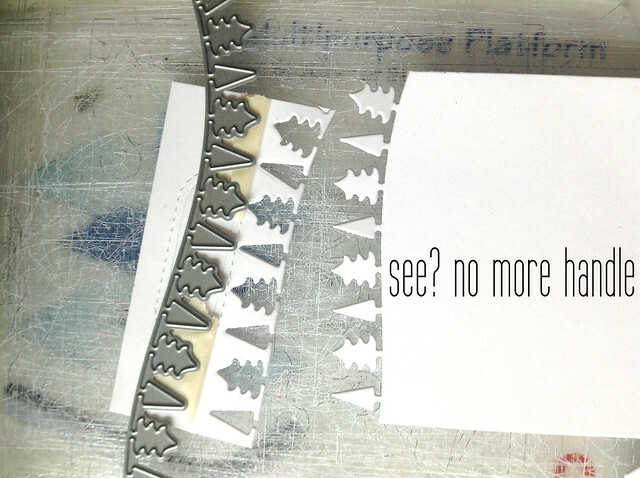 To create the double-ended banner, I used the one-sided flag, (from the large stitched journaling card die set) sending it halfway through my Big Shot, and then flipping it over and doing the same on the other side. easy peasy. 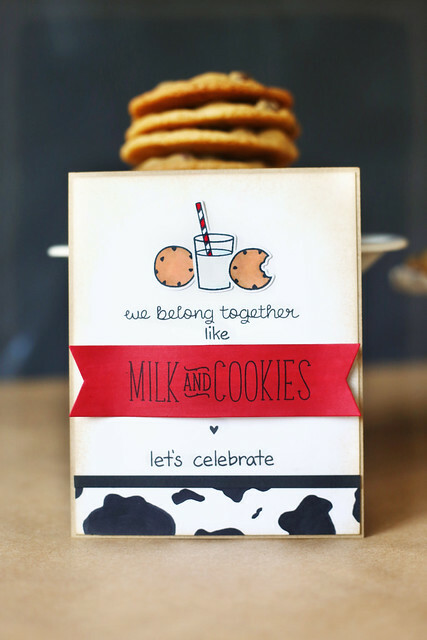 I also did the same thing for the milk & cookies banner on the invitation you saw above. 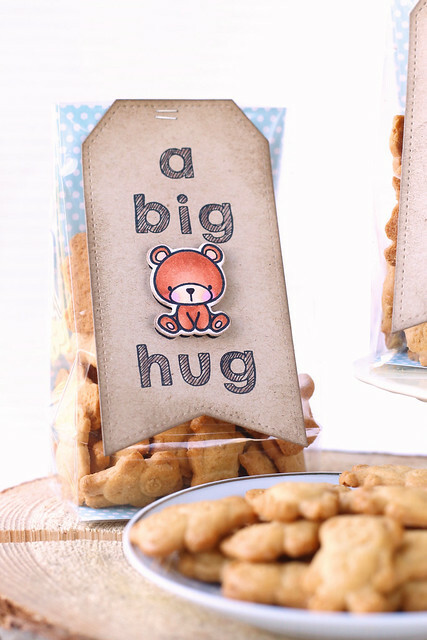 Every party needs a take-home favor. 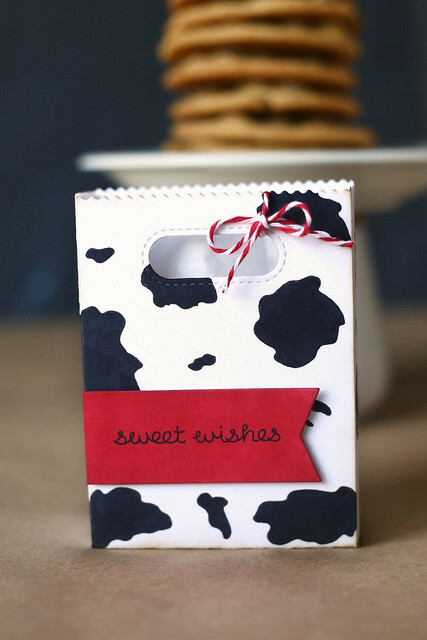 I scribbled on the fancy cow-print again, added a little tag and tucked a couple of cookies inside. These were for my hubs, who couldn't party with us after school. A consolation prize, ha. 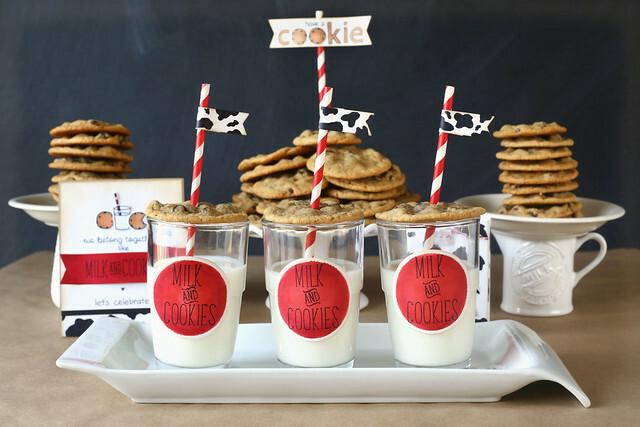 I hope you like my milk & cookies party! 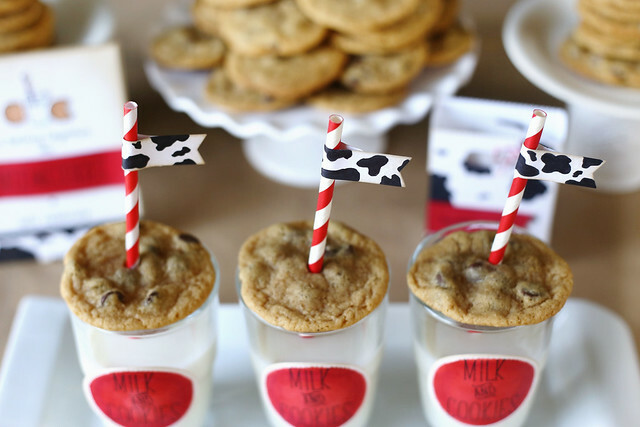 Hop over to the lawn fawn blog for a link to the chocolate chip cookie recipe I've been using for years - it's foolproof, especially if you slightly underbake the cookies. YUM!